In order to attain personal satisfaction and enrichment, through actions that respect the traditional volumes and building techniques. Rendering at the same time old and ruined houses with no roof more hygienic and readapting their compartments so as to show people they can live inside the same space their acestors lived, in conditions compatible with the modern life conforts. Showing them popular architecture is more beautiful, is simpler, is more integrated in the environment and is on top of it all more economical. 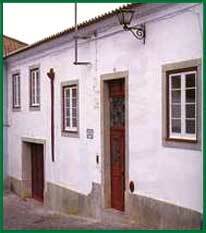 To recreate an old house, from its original plant is a compensatory and extremely rewarding job. It allows us to build the future without despising the promises left by the past. Whenever it was possible the plaster covering the existing "tijolo burro" (very thick and compact brick) was removed and the wainscotting uncovered so as to be again part of the surrounding architecture. The building revealed several different pathologies in the stuccos and interior woods, due to infiltrations caused by the ruined covering and humidity rising by capillarity at the level of the basement and groundfloor facings. Most of the woods of the external frameworks were rotten as they were exposed to the open air. The water, sewage, gas and electricity distributuion systems were obsolete and in bad condition. As far as the architecture was concerned, the variety of materials used, showed the different periods in which the building was renovated.